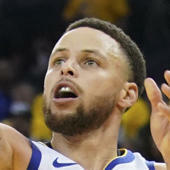 Time for a new weekly tradition: My Monday Power Rankings of NBA teams, from the defending champion Golden State Warriors all the way down to the 30th-ranked team. What would it take for the Warriors to drop from the No. 1 spot? A major injury to a star? Two major injuries? A resurgent Carmelo Anthony who somehow turns the Rockets' offense into one of the best we've ever seen? There isn't much that'll knock the Warriors off the mountaintop. Because even if they sleepwalk through parts of this season, we can still presume they'll be the team to beat once the playoffs start. These power rankings will be based on teams' current record but will not be bound to that. In other words, if the Orlando Magic again start the season with an 8-4 record, I'm not going to vault them into my top 10 on that basis. I'll be using some common sense here. But if an out-of-nowhere team is still chugging come January, I'll reevaluate.